Take-all disease caused by the soil-borne fungus Gaeumannomyces graminis var. tritici (Ggt) is the most widespread and well-studied root disease of winter wheat. The absence of plant genetic resistance and efficient fungicide against this disease calls for the development of alternative management strategies such as the use of biological control agents. In a greenhouse experiment, we tested the hypothesis that the earthworm Aporrectodea caliginosa can control this plant pathogen by changing soil pH, inducing plant defence mechanisms or improving plant nutrition. Towards this aim, soil chemical properties, plant production, morphology and transcriptome were assessed in the different treatments to characterize the effects of Ggt, earthworm and the interaction between them. Sixty three days after sowing, Ggt was responsible for a strong reduction in fine root proportion and leaf area, and an 82 % decrease in plant total biomass. 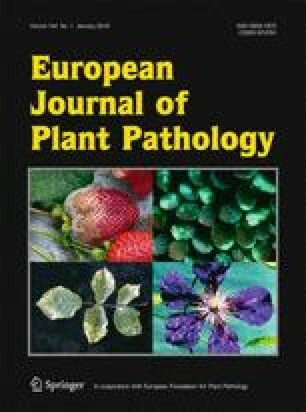 Earthworms reduced infection rate by 63 % and improved plant growth, which was not significantly different from the no-pathogen control. Neither changes in soil pH, plant defence mechanisms or plant nutrition were proved to be involved in this effect. It was concluded that A. caliginosa was a very efficient biocontrol agent against Ggt and that the mechanism responsible for this biocontrol effect could be associated with microbial community modifications or fungal consumption by earthworms. The online version of this article (doi: 10.1007/s10658-015-0759-8) contains supplementary material, which is available to authorized users. This work was supported by AgroParisTech (France). We are very grateful to Damien Marchand for technical assistance and to Germain Meulemans for English language editing. We also thank the INRA IGEPP laboratory (Rennes, France) for providing fungus inoculums.